- Publisher Baptists' Timothy George and David S. Dockery update and substantially reshape their classic book in an effort to preserve and discover the Baptists' "underappreciated contribution to Christianity's theological heritage." George and Dockery have re-arranged this volume--considerably abbreviated from the seven-hundred page first edition--in light of the Southern Baptist identity controversy. - Publisher A resource for pastors, students and teachers to discover Baptist contributions to Christianity's theological heritage. 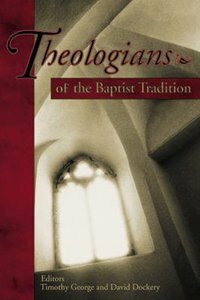 About "Theologians of the Baptist Tradition"
Baptists' Timothy George and David S. Dockery update and substantially reshape their classic book in an effort to preserve and discover the Baptists' "underappreciated contribution to Christianity's theological heritage." George and Dockery have re-arranged this volume--considerably abbreviated from the seven-hundred page first edition--in light of the Southern Baptist identity controversy. Customer Reviews For "Theologians of the Baptist Tradition"
For the serous Baptist preacher! A collection of essays tracing the historical Baptist (Southern Baptist) tradition through the brief theology of those who most influenced the denomination. Beginning with John Gill (1697) and chronologically moving through the lives of 15 others the essays end on Millard Erickson (current). Each essay has a similar layout, beginning with a short biography, moving to the exposition of theology, spending a few pages on specific theological contributions, ending with an evaluation of the theologian's strengths and weaknesses. Some may want to place this book as a reference within their library. I recommend every serious Baptist preacher read it through; at least to better understand the trajectory of Baptist theology, albeit with Southern Baptist flavour. Although not all authors have an engaging style, the men discussed are engaging. At times I found the book incredibly saddening and at other times positively encouraging. For the serious Baptist reader, essential for the Baptist preacher!